My dressing table is a focal point for me in my bedroom. I spend most mornings getting ready at it and have got it set up so that everything is ready for me to use when I'm still half asleep when I'm getting ready for work. I know everyone likes a nose around (myself included! 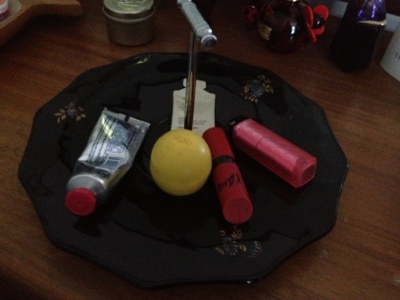 ), so I wanted to give you a little tour of my dressing table. The table itself was a gift from my boyfriend. I love vintage furniture and my dressing table dates back to the 1960's. It's made from golden teak wood and has a massive mirror that runs along the top of it, which is my daily saviour! I've split my dressing table up into little areas. The first one is for hair products. Here I have Elnett hairspray, Mark Hill heat protector, Percy and Reed dry conditioner Umberto Gianni backcomb in a bottle, Bumble and Bumble salt spray and a Toni and Guy salt spray (I like salt sprays!). 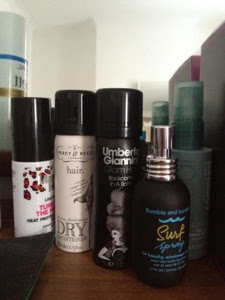 The products I use each morning vary depending on whether I'm going for straight or wavy hair. 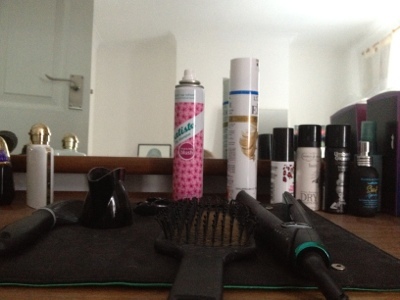 In front of these, I keep my GHD straighteners, dry shampoo, plus hairbrushes and combs (please excuse the hair). 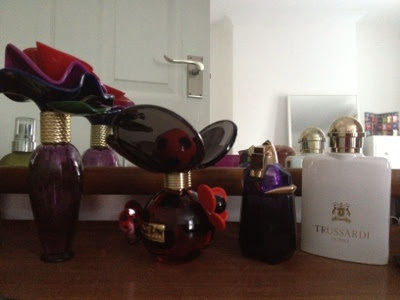 To the left, is my perfume collection. At the moment this includes: Marc Jacobs Lola, Marc Jacobs Dot, Thierry Mugler Alien and Trussardi Donna. In front of these I have a little vintage cake stand that I use to keep rogue lipsticks/balms and any extras that I use on a regular basis. 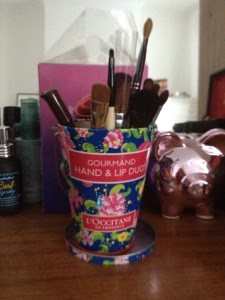 The final area has a pot for my makeup brushes, and my little piggy bank that I'm saving the money from my 'use it up challenge' in. You can also see another bottle of perfume in the background - this is a mega bottle of Lola that I was given for Christmas by my lovely boyfriend as my other one has virtually run out. Brushes and my pink piggy bank. Phew! So that's the whistle-stop tour. What have you got on your dressing table? As people have said above I love these posts, you are very organised! 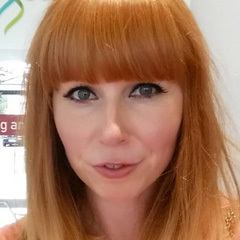 I've just discovered your blog as I was drawn to the name, I'm also very pale so its good to see your skin care recommendations.